Climate change isn't happening at all. If you think the world is getting warmer, then I'd love to see you prove it. Scientists have known about global warming for decades. It's real. So let's move on to what we can do about it. The 2009 State of the Climate report of the U.S. National Oceanic and Atmospheric Administration (NOAA), released in mid-2010, brings together many different series of data “from the top of the atmosphere to the depths of the ocean." The conclusion? All of these independent lines of evidence tell us unequivocally that the Earth is warming. The very accessible 10-page summary (PDF) examines the trends for 10 key climate indicators using a total of 47 different sets of data. All of the indicators expected to increase in a warming world are in fact increasing, and all that are expected to decrease are decreasing. 1. Land surface air temperature as measured by weather stations. You know all those skeptic arguments about how the temperature record is biased by the urban heat island effect, badly-sited weather stations, dropped stations, and so on? This is the only indicator which suffers from all those problems. 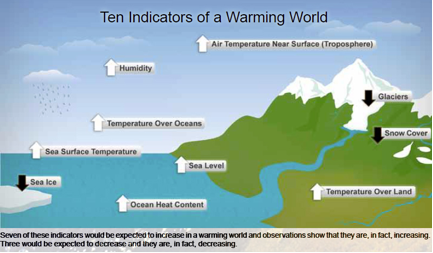 So if you’re arguing with somebody who tries to frame the discussion as being about land surface air temperature, just remind them about the other nine indicators. 2. Sea surface temperature. As with land temperatures, the longest record goes back to 1850 and the last decade is warmest. 3. Air temperature over the oceans. 4. Lower troposphere temperature as measured by satellites for around 50 years. By any of these measures, the 2000s was the warmest decade and each of the last three decades has been much warmer than the previous one. 6. Sea level. Tide gauge records go back to 1870, and sea level has risen at an accelerating rate. 7. Specific humidity, which has risen in tandem with temperatures. 8. Glaciers. 2009 was the 19th consecutive year in which there was a net loss of ice from glaciers worldwide. 9. Northern Hemisphere snow cover, which has also decreased in recent decades. 10. Perhaps the most dramatic change of all has been in Arctic sea ice. Satellite measurements are available back to 1979 and reliable shipping records back to 1953. September sea ice extent has shrunk by 35% since 1979. Science isn’t like a house of cards, in that removing one line of evidence (e.g., land surface air temperature) wouldn’t cause the whole edifice of anthropogenic global warming to collapse. Rather, “land surface warming” is one of more than ten bricks supporting “global warming”; and with global warming established, there is a whole other set of bricks supporting “anthropogenic global warming." To undermine these conclusions, you’d need to remove most or all of the bricks supporting them — but as the evidence continues to pile up, that is becoming less and less likely.